One of the most beautiful and emotional weddings I’ve captured recently. The sweetest thing to ever happen on Tax Day! Una boda short & sweet, y muy especial. Lots of fun and lots of love. Pure bliss. Wow. No hay palabras para este día. Beautiful, fun, and definitely not-your-typical destination wedding. As tropical as it gets! 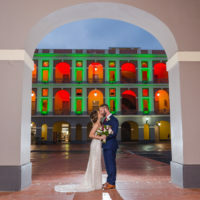 Aimee & David hopped off their cruise, got married, did portraits, went for dinner, and got back on their cruise. That’s what I call efficiency. En la boda de Miralis y José no faltó belleza, ternura, ni fiesta. ¡Nos la disfrutamos de principio a fin!